One only has to go to any rummage sale or swap meet and watch people pawing through the mountains of old collectibles to realize that there is probably a collector for virtually everything man has ever made. I personally collect antique stereoscope views, old postcards but only candid views of American cities (I’m very fussy), Titanic memorabilia and printed material on the famous and unsolved, I might add, Lizzie Borden double ax murders in 1892, of which I have close to 40 books and newspapers. Motorcade Detail for several years; we already have his complete uniform and all his equipment. There will also be an LAPD S.W.A.T. vehicle (Suburban) replete with officers and equipment. Custom mannequins representing the involved officers are being created to display their uniforms and equipment. Talk about being immortalized! On September 20th LAPM will deliver the restored vehicles to the Reagan Museum in full motorcade fashion amid considerable pomp and circumstance; a major media event is being planned for the occasion. What a great honor and privilege to be part of a permanent exhibit featuring one of our greatest presidents ever…Ronald Reagan. By the way, the Reagan Trust commissioned this exhibit with specific instructions from President Reagan himself that LAPD should be the featured police department. Out of all the agencies that could have been selected, President Reagan chose the BEST…LAPD! 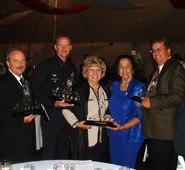 This year’s honorees, (photo below) from left to right: Paul D. Bardon, Director of Police Transportation II, Motor Transport Division; Lt. Robert Green, Officer-In-Charge, LAPD Bomb Squad; Ms. Leticia Aguilar, President, Bank of America Central Los Angeles Market,and Consumer Executive, Greater Los Angeles and Central California Division; Ms. Marguerite P. Justice, Community Leader and former Los Angeles Police Commissioner; and Mr. Foster S. Dennis, President, California Paving and Grading Company, Inc.
Each of these honorees steps up to the plate every day and makes a difference in spite of challenges or obstacles, putting their personal agendas aside for a greater purpose. Their word consistently translates to action, backed by their personal commitment and a clear vision for what can and should be achieved. LAPM has accelerated the development of two places of honor in which Memorial bricks are being installed. 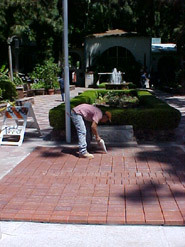 In cooperation with the Los Angeles Police Revolver and Athletic Club (LAPRAAC), an expanded plot has been created at the entrance to the flag courtyard at the Police Academy for a “Walk of Remembrance.” The first photo (below) depicts the newly completed plot with over 300 bricks already permanently installed. The second photo (on the right) shows the “Wall of Remembrance” at the Los Angeles Police Museum and Community Education Center in Highland Park. Both areas have been designed to allow a significant number of additions. Memorial bricks can be purchased for any number of reasons: to commemorate one’s career; in memory of a loved one, a family member, or a friend; for company recognition as a Museum supporter; “Chief’s Circle” members/donors; in memory of a fallen officer; in memory of a retired officer or civilian employee; as a family tribute; etc. Bricks can be purchased from LAPM individually for $100 or two for $150. For engraving purposes, both bricks ordered together must have identical wording. Policeman II Michael Joseph Regan, Serial #2356, passed away on Saturday, July 24, 1904, in Los Angeles. Michael was born in San Francisco on September 28, 1917. He was appointed to the Los Angeles Police Department on January 6, 1941 and retired on December 1, 1964; he was last assigned to Hollywood Area. 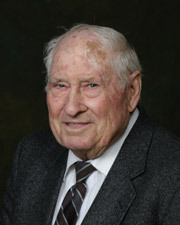 Mike’s LAPD service was temporarily interrupted when he was drafted into the U.S. Army during WWII. He served in the European Theatre of operations and participated in countless major battles; he was awarded the Bronze Star for heroism. Mike also served as past Commander, American Legion Police Post 381, and he remained active in Legion activities throughout his life. After retiring with 24 years of LAPD service, Mike was appointed as the Emergency Services Coordinator for the City of Los Angeles. He served brilliantly in this capacity for 20 years, retiring in 1988.
persons involved…with absolute certainty…strictly from memory! Mike was also a wonderful storyteller, and he loved to spin a yarn—just ask his children. Ever a true Irishman, Mike loved Gaelic music, traditions and folklore, filling his life and his home with rich, vibrant memories. Michael is survived by his beautiful wife of 49+ years, Margery, and their three sons: Michael Jr., Dennis and Kevin. Mike and Margery are also blessed with seven grandchildren. They have lived in the same Highland Park home for nearly 48 years. Even during periods of recent, grave illness and subsequent recovery, Mike would insist on coming into the LAPD Museum to volunteer. And come he would…whether on a chair with rollers, on a walker or in a wheelchair…he would be there, in a place he dearly loved. Mike was never a quitter! Reverend Father Michael McCullough conducted a beautiful Funeral Mass on Friday, July 30th, at Saint Teresa of Avila Catholic Church in Los Angeles to celebrate Mike’s rich life of service to his family, his country and his beloved LAPD. Mike was then laid to rest in Forest Lawn-Hollywood Hills, to the accompaniment of full Department and Military honors. owners of the collection would be posted; 12the duration of the display would be mutually decided. Think about it. What’s the fun of having those neat things if you can’t share their fascination with others? And the best thing is that at the same time you will be helping us bolster the drawing power of your L.A.P.D. Police Museum. As I have said before, “this is not the Board of Director’s Museum, it belongs to all of us sworn officers and civilians who have been fortunate to be members of this great Department and who have contributed to its evolution and history.